Very rocky tech trail. 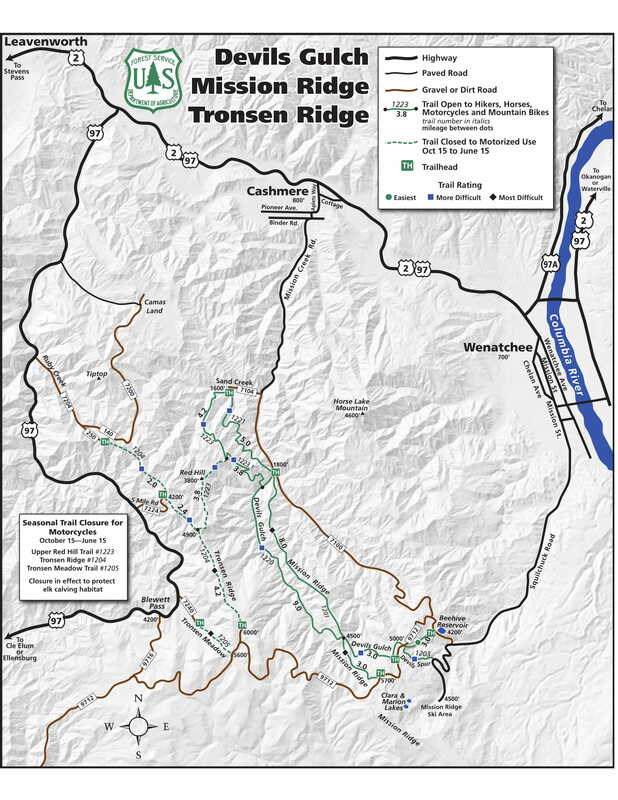 The trail crosses the Devils Gulch Trail allowing you to ride the upper section of Mission Ridge Trail and the lower section of Devils Gulch Trail. From Wenatchee, WA, follow Squilchuck Road south for 7 miles. Turn right onto Mission Ridge Road/Wenatchee Mountain Road. Follow this road for 1 mile, then take the first right onto Beehive Road/Forest Road 9712. Follow this road for 2.3 miles, keeping left at the forks. Turn left onto Liberty Beehive Road/Forest Road 9712 and go 3.7 miles. The trailhead will be on the right.